This Poinsettia Christmas Wreath is Simple yet Stunning. This wreath is my dads and hangs over his fireplace. 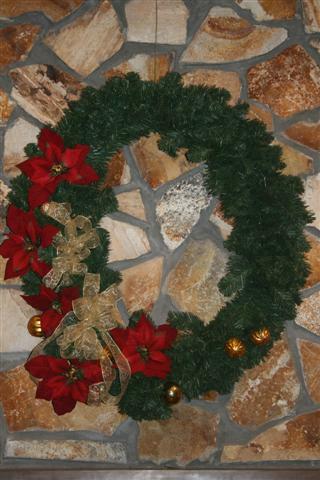 This wreath was made by my sister and was originally made as a decoration for his Christmas party. This is a pretty good size wreath. She started with a oval evergreen wreath form then added red poinsettias, gold Christmas balls and a gold ribbon. Perfect for the party and has been enjoyed each year since.